Click Here to Quickly Jump to the latest post in: “Saladin and the Crusades” or continue reading to learn more about this fascinating time in history, and find links to each post within this topic. Ṣalāh ad-Dīn Yūsuf ibn Ayyūb (Arabic: صلاح الدين يوسف بن أيوب‎; Kurdish: سه‌لاحه‌دین ئه‌یوبی , Selahedînê Eyûbî; Turkish: Selahattin Eyyubi) (1137/1138 – March 4, 1193), better known in the Western world as Saladin, was the first Sultan of Egypt and Syria and the founder of the Ayyubid dynasty. A Muslim of Kurdish origin, Saladin led the Muslim opposition against the European Crusaders in the Levant. At the height of his power, his sultanate included Egypt, Syria, Mesopotamia, Hejaz, and other parts of North Africa. …Under Saladin’s personal leadership, the Ayyubid army defeated the Crusaders at the decisive Battle of Hattin in 1187, leading the way to the Muslims’ re-capture of Palestine from the Crusaders who had conquered it 88 years earlier. Though the Crusader Kingdom of Jerusalem would continue to exist for an extended period, its defeat at Hattin marked a turning point in its conflict with the Muslim powers of the region. Saladin has become a prominent figure in Muslim, Arab, and Kurdish culture. His reportedly noble and chivalrous behavior was noted, even by Christian chroniclers, and despite being the nemesis of the Crusaders, he purportedly won the respect of many of them, including Richard the Lionheart who led the Third Crusade. In 1193 he died in Damascus, having given much of his wealth to his subjects. Saladin is buried in a mausoleum adjacent to the Umayyad Mosque. For nearly 200 years after Cairo was established, the administrative centre of Egypt remained inFustat. 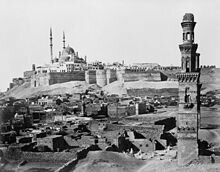 However, in 1168 the Fatimids under the leadership of Vizier Shawar set fire to Fustat to prevent Cairo’s capture by the Crusaders. Egypt’s capital was permanently moved to Cairo, which was eventually expanded to include the ruins of Fustat and the previous capitals of al-Askarand al-Qatta’i. While the Fustat fire successfully protected the city of Cairo, a continuing power struggle between Shawar, King Amalric I of Jerusalem, and the Zengid general Shirkuh led to the downfall of the Fatimid establishment. In 1169 Saladin was appointed as the new vizier of Egypt by the Fatimids and two years later he would seize power from the family of the last Fatimid caliph, al-‘Āḍid. As the first Sultan of Egypt, Saladin established the Ayyubid dynasty, based in Cairo, and aligned Egypt with theAbbasids, who were based in Baghdad. During his reign, Saladin also constructed the Cairo Citadel, which served as the seat of the Egyptian government until the mid-19th century. 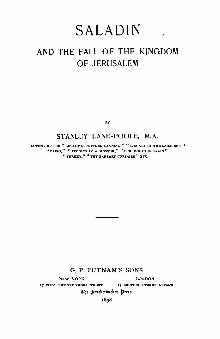 In 1903, Dr. Stanley Lane-Poole wrote “Saladin and the Fall of the Kingdom of Jerusalem.“ He was a British orientalist and archaeologist, born in London, England, on 18 December, 1854. Dr. Lane-Poole worked in the British Museum from 1874 to 1892, and following this, he spent time in Egypt, researching Egyptian archaeology. He was a Professor of Arabic Studies at Dublin University, from 1897 to 1904. Dr. Stanley Lane-Poole wrote over 20 books on the subjects of Islam, the Crusades, India, Turkey, Egypt, and the Middle East. He died on 29 December, 1931. I found “Saladin and the Fall of the Kingdom of Jerusalem” to be such a fascinating book! It is an incredibly fair and impartial account of the Crusades from a perspective of both sides of the battles, taken from historical accounts of eye witnesses. There is no demonizing of the enemy, and no propagandizing of the hero in Dr. Lane-Poole’s narrative. Written in a style both historical and exciting, it was captivating and I couldn’t put it down. This is a book now in the public domain, and I offer it here in an easy to read format. Each post consists of one chapter, complete with accompanying historical illustrations. The Tables of Contents and Illustrations are interactive and can be clicked on to jump quickly to the desired page. I like very much your blog and on behalf of Starwood Hotels Egypt , I invite you to Iftar party on 1st July at Le Meridien Cairo Airport Hotel. Our company is much interested in blogging being a trustworthy review channel . Appreciate if you can call me at 01006005056 or send me your mobile no. so that I can call you first to get to know each other and invite you in person to this Iftar particularly arranged for bloggers. Kind regards and Happy Ramadan .